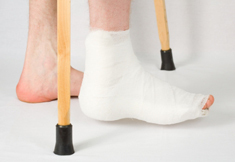 Recent reports say that the ankle injury is one of the most common among leg injuries. We may hurt ourself in the consequence of the slip, trip or fall. If this painful and problematic injury affects our ability of walking only tmporarly and the treatment is not very complicated you may claim for £7,000 - £14,000. More severe injuries, in which you become unable to work for many monthes are awarded with the sum from the level from £7,000 up to £14,000. Please, remember that each accident should be investigated by the lawyers indyvidually and all above information are not applicable in all cases.